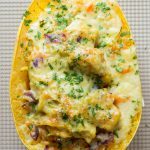 These chicken spaghetti squash boats can be prepared in only 20 minutes!!! Fill them with mega healthy Broccoli Cole Slaw seasoned with cajun spice, top with delicious melty cheese and pop under the broiler for only a couple of minutes. PERFECTION on the dinner table! This is the most veggie loaded recipe I’ve made all year and I LOVE it!!! The base itself is a vegetable, the filling is mostly vegetable and yet, it feels like you’re eating lasagna. Mind-blown. #1 Pressure cook: Wash your squash, cut it in half lengthwise, remove its seeds with a spoon and season with a little sea salt. #2 Roast in the oven: Wash your squash, cut it in half lengthwise, remove its seeds with a spoon and season with a little sea salt. Preheat oven to 400F (200C) and place squash halves cut site down on a baking sheet. Once oven is hot roast for 40-60 minutes depending on the squash’s size. Use a fork to to insert and find out after 40 minutes. It should easily slide in. 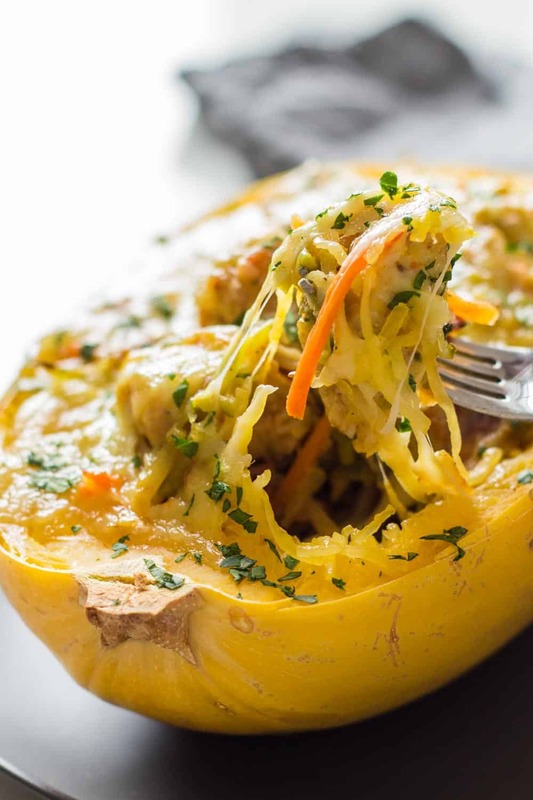 Spaghetti squash has a very very mild taste so you want to fill it with a very flavorful filling. Chicken with broccoli cole slaw seasoned with cajun spice is about the best thing on this earth! SOOO flavorful!! If you don’t know what Cajun Seasoning is, lot me quickly list the ingredients to give you a broad idea of the deliciousness: paprika, coriander, mustard, turmeric, fennel, black pepper, cumin and garlic. I mean, you all know I’m obsessed with Broccoli. If you’re like me, make sure to also check out how to make broccoli rice. Best side dish ever! Big big shout out to this amazing company for sponsoring this post. You are awesome! I am so happy I was given the opportunity to create a recipe for you! It was a real pleasure to come up with this recipe. And thank YOU, my lovely readers, for supporting the brands that support Green Healthy Cooking! 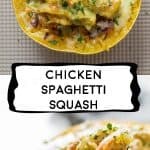 I hope you love this Chicken Spaghetti Squash as much as I did! Make sure to tag @greenhealthycooking when you post a photo of your finished dish. I’d love to see! Wash and dry spaghetti squash and cut in half lengthwise. Either cook in the pressure cooker for 8 minutes on high pressure quick pressure release or the in the oven for 40-ish minutes at 400F (see more detailed instructions in blog post above). While spaghetti squash is cooking prepare filling. Preheat a large pan over medium heat. While pan is preheating cut chicken breast into 2 inch cubes. Add oil to hot pan and then place chicken cubes carefully into pan making sure to not overcrowd the pan and leave some room between each cube (see video). Salt and pepper to taste and sprinkle evenly with cajun seasoning. Fry for 2-3 minutes on one side and 2-3 minutes on the other or until done. 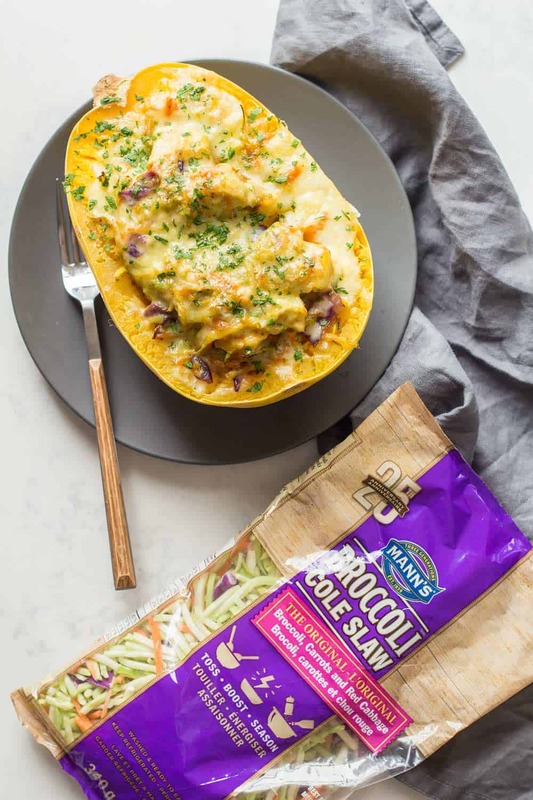 Add Mann's Broccoli Cole Slaw and stir-fry until the slaw softens to your liking. It's better to undercook a little as everything will still go under the broiler. 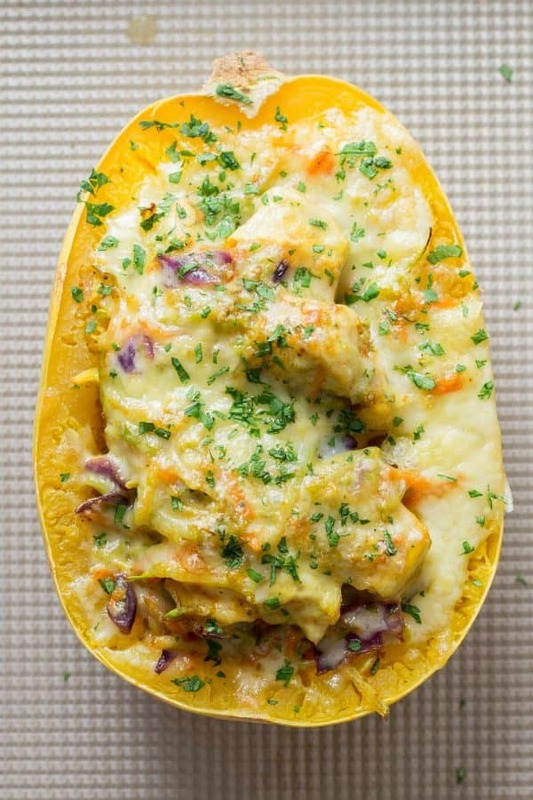 Place cooked spaghetti squash on a baking sheet, fill with chicken-slaw mix and top with grated cheese. Broil on high for 5 minutes or until cheese has completely melted. Sprinkle with freshly chopped parsley and enjoy! Loved this!! Must admit I changed a few things but this has instantly sky rocketed to my mine and my husband’s alltime favorite meals list. Simple, quick, easy and sooo amazing. Perfect for cold weather days. Thanks again!! I am so incredibly happy you like it Meg!!! Just made this for dinner. We absolutely loved it! 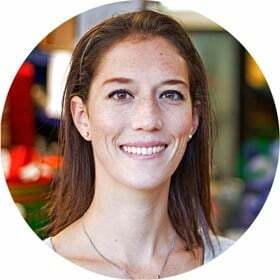 Can’t wait to try out more delicious and healthy recipes from you!